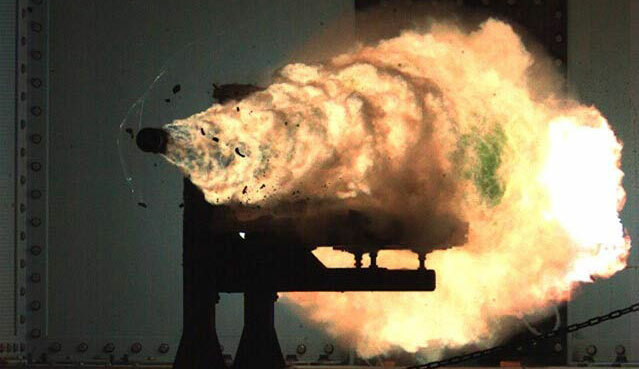 An electromagnetic railgun offers a velocity previously unattainable in a conventional weapon, speeds that are incredibly powerful on their own. In fact, since the projectile doesn’t have any explosives itself, it relies upon that kinetic energy to do damage. And at 11 a.m. today, the Navy produced a 33-megajoule firing — more than three times the previous record set by the Navy in 2008. Ugh 2025… and only on ships? I want one NOWWWWWW! Yeah. For US gov., Eurasia = terrorists. We can’t show them our gun vids… Ah well.